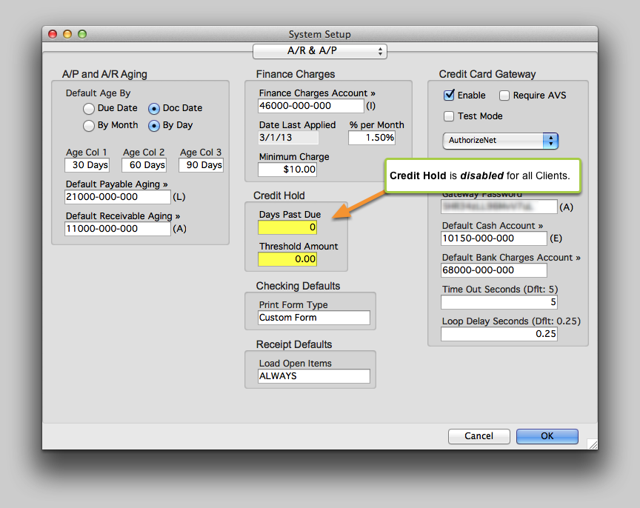 The Credit Hold function of AcctVantage allows you to set parameters that will trigger Credit Hold status for Clients. By default, a status of “on Credit Hold” will trigger warnings when opening Client records or opening a Sales Order for a Client. Credit Hold can be enabled or disabled globally or for individual Clients. By default, AR charges are blocked for Clients who are over their credit limit. This block can be over-ridden only by users specifically given that access in User Access Levels. AR charges are not blocked for Clients who are past due, but still within their credit limit. Navigate to Administration ➤ System Setup and select A/R & A/P from the drop down menu. 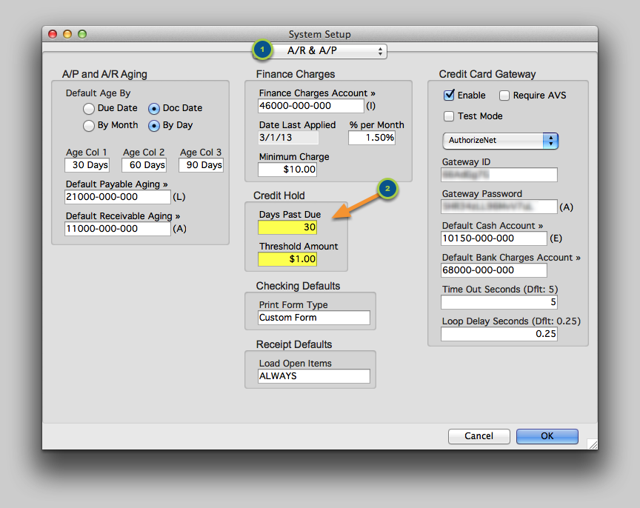 Credit Hold is enabled by entering any value other than 0 in the Days Past Due and Threshold Amount fields. In the example below, Credit Hold will be triggered for Clients who are either 30 days past due or $1 over their Credit Limit. This does not prevent you from selling to this Client. It merely turns on Credit Hold warnings when opening the Client record or processing a Sales Order [for the Client]. The Credit Hold function may be disabled for all Clients by entering 0 in these same Days Past Due and Threshold Amount fields. It may be desirable to exempt a specific Client from Credit Hold, if for example the Client chronically pays a bit late but is otherwise a good customer. Likewise, you may have a Client who currently is not past due, but who has a poor payment history, that you wish to permanently place on Credit Hold status. 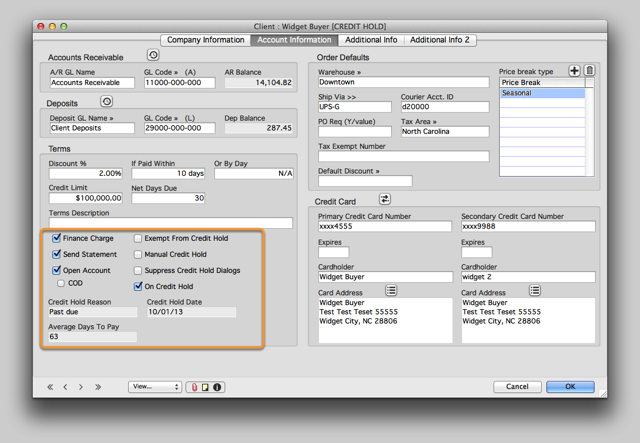 Setting Clients’ Credit Hold status individually is done through the Account Information tab of the Client record. Exempt from Credit Hold: Excludes a Client from being placed on Credit Hold regardless of their Days Past Due or amount over their Credit Limit. Manual Credit Hold: Places a Client on Credit Hold regardless of their current account status. Suppress Credit Hold Dialogs: Allows you to use the Credit Hold function, which may be useful for reporting, but disables the system warnings when opening Client records or processing Sales Orders. On Credit Hold: This checkbox is not user-selectable. It is checked when a Client is on Credit Hold. Credit Hold Reason: This field will display whether the reason for Credit Hold is Past Due, Over Credit Limit or due to Manual Credit Hold setting. Only one reason is displayed, in the following order of priority: Manual Credit Hold, Over Credit Limit or Past Due. This means that if a Client is both Over Credit Limit and Past Due, the reason displayed will be Over Credit Limit. If the manual Credit Hold checkbox has been checked in addition to the Client being Over Credit Limit and Past Due, the reason displayed will be Manual Credit Hold. Credit Hold Date: This field will display the date that Credit Hold became effective. Average Days to Pay: This field will display average length of time between Invoice Date and the date that AR amounts are Paid in Full.